OUR BROAD EXPERIENCE in foreign trade and international marketing provides a wealth of insight we make available to our clients. HCI has made over 500 marketing presentations worldwide, and over the last decade we have won contracts from 7 out of 10 prospects. HCI’s proven marketing experience will help you establish the long term business relationships that result in a profitable presence in foreign markets. Top export management companies customarily win about 1 out of 10 export bids. Due to our practical focus, bottom-line orientation and extremely cost-effective approach, Henderson Chemicals (HCI’s forerunner) won better than 4 out of 10 bids. 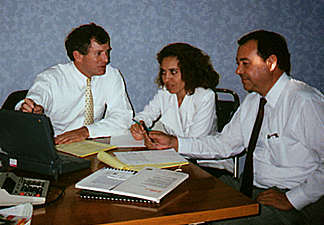 Market Research interviews with potential foreign buyers and agents, which often generate immediate sales opportunities. Finding and winning the best agents, brokers and partners for your products. HCI’s foreign staff customarily interviews 20-30 prospective partners, then selects only the top performers. Our unique Agent Selection Criteria enable us to identify the most effective agents in your field. HCI’s knowledge of foreign business allows us to negotiate the most favorable terms and contracts with these agents and brokers. HCI can set up a ‘Direct Marketing Program’ that gives you direct control of buyer relationships, service quality, logistics and communications, all facilitated by HCI's hands-on training of your sales staff. Extensive action plans with step by step directives for every phase of your export operation to eliminate most missteps and losses. Our proven Agent Performance Systems provide standards and procedures for your agents sales representatives, including steps for making effective presentations, follow-up and closing orders. HCI’s foreign sales staff can even handle all your marketing and operations for you if you prefer a totally hands-off operation. HCI international marketing consultants offer 24 years of hands-on international marketing experience to successfully launch your company in foreign markets.